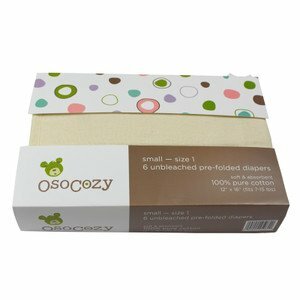 OsoCozy Unbleached Prefold Diapers - Our unbleached Indian cotton prefolds quilt up nice and thick, are soft, very absorbent and lint free. The material is sanforized so that the diapers feel nice right out of the box. The internet's best selling prefold diaper! 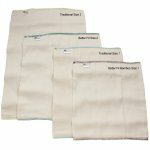 Unbleached Prefold Diapers - Each package contains 6 diapers and comes with dual language use and washing instructions on the back side (English and Spanish). Packaged prefolds come in two sizes only. Size 1 is the Infant 4x8x4 diapers and Size 2 is the Premium 4x8x4 diapers. *These prefolds shrink about 12% in width and 14% in length.